Rodney Marvin “Rod” McKuen (April 29, 1933 – January 29, 2015) was an American singer-songwriter, musician and poet. He was one of the best-selling poets in the United States during the late 1960s. 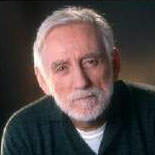 Throughout his career, McKuen produced a wide range of recordings, which included popular music, spoken word poetry, film soundtracks and classical music. He earned two Academy Award nominations and one Pulitzer nomination for his music compositions. McKuen’s translations and adaptations of the songs of Jacques Brel were instrumental in bringing the Belgian songwriter to prominence in the English-speaking world. His poetry deals with themes of love, the natural world and spirituality. McKuen’s songs sold over 100 million recordings worldwide, and 60 million books of his poetry were sold as well, according to the Associated Press. "Eternity sneaks in. Her arm..."